Summer isn’t over – although the air is so much more dry than it has been, it is still plenty warm out. I am loving it, since the pressure of all that digging is behind me. This morning we brought a ton of pellets in and stacked them in the cellar – A and L will do the 5th and last one tomorrow while I am at my brother’s BBQ. How did that happen? Well, it needs doing, and she wasn’t excited about a pool oriented party, since she doesn’t do pools. I think I got the better part of this arrangement. I got the last few photos off the camera. I discovered that what isn’t working is the display. So, I can still take photos, I just can’t see them, and I am not sure it will focus on what I want it to. I’ll experiment, and see what happens. Unless it comes out pretty cool, I won’t subject you to my experiments, but will just learn to deal with the camera on the phone. Ya know. Later. 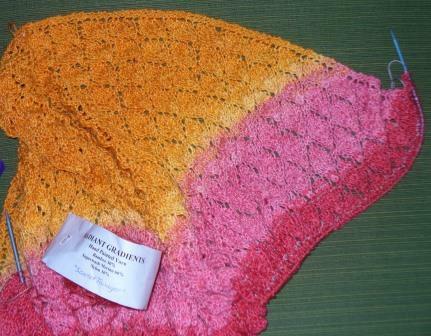 Lace leaf shawl… I have done one more repeat of the leaf pattern and started the edging since I took this one. 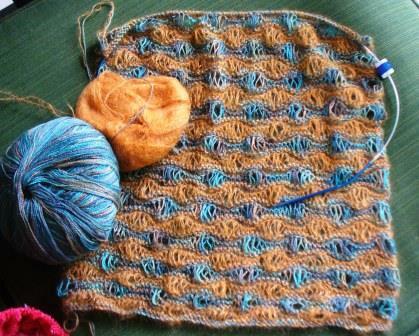 teal and gold waves stole/scarf… it grows slowly. Gratuitous cute cat photo. Allie supervises everything. Through cat slit eyes. She only looks relaxed! A week since my last update? 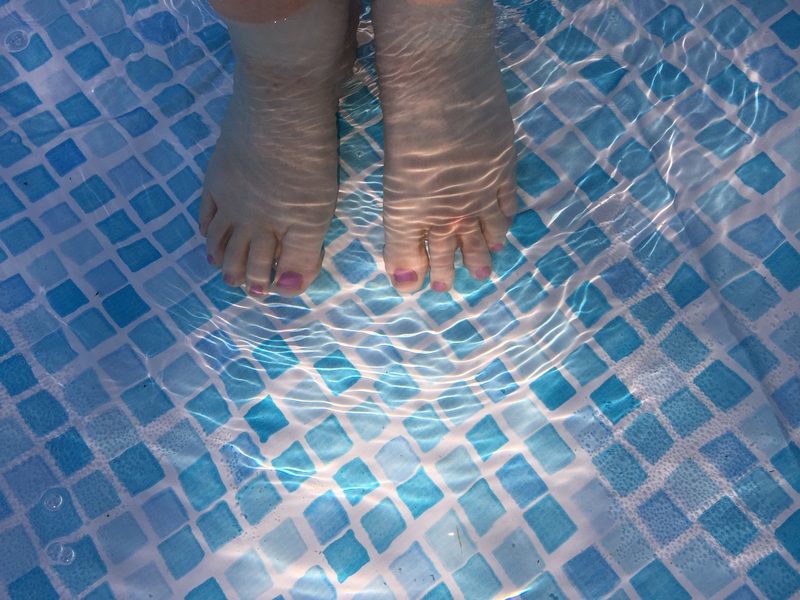 We had a nice weekend – although it rained VERY hard Saturday, it cleared up for about half an hour in the afternoon, so I got a swim in. 🙂 And did lots of shawl knitting while I waited. My lace leaf shawl in Purple Fleece’s Scarlet Tanager is nearly done – I have lots of lifelines so that I can use it all – I’ll just keep going until I run out, or it is obvious how far I can get with what’s left, and then rip back enough to do the border. I am well into the deep pink now, so I think I have only one more pattern repeat to do before the border. Sunday, Mom and I had scheduled a sail, but sadly, there was no wind. Naturally, we went out to lunch and yarn shopping instead. We rescheduled the sail for Labor Day weekend, though, so we won’t get through the whole summer with no sail. Mom asked me if I actually use the shawls, and was surprised when I said yes, I wear them to work a lot, since it is cold in my office in the summer and in the winter. Then her eyes lit up “they don’t have to FIT!” I think Mom might start knitting shawls as soon as she finishes her current cardigan. But what my next project will actually be (maybe!) is a sweater vest made from all the blues I dyed for the leftie shawl. I will be doing it by the seat of my pants – there is a pattern I have knit many times, but can’t find (I lent it to someone, I think) so I am going to do it by memory and logic. Should be a lovely garment! Then I will make hats with whatever is left. Last night I went up to Husson University to see niece B, who moved back to campus on Sunday. We had stored a load of her things for the summer, so I brought them up to her. She is still getting settled, and it is hot in the dorm, so it was just a quick visit. It is good to see her again, and it seems like she might be open to more auntie visits this year – she has a more reliable car and I have a pool. Also a washer and dryer, and good food and a comfortable bed. All the important things for a college senior, right? 🙂 I am sure going to miss her when she finishes with school, even though I don’t see as much of her as I would like to. Now, off to figure out the whole phone camera thing. Author salpal1Posted on August 25, 2015 August 25, 2015 Categories how I spent my day, how it came out, what I am thinking about makingTags camera woes, family, knit, RAIN, sail11 Comments on A week since my last update? Terry Gross did it again last night on one of my favorite radio programs, Fresh Air. For those of us listening to the whole show, who is your guest? Someone else? The construction “if…then” has two parts, with a basic understanding that “if not, then something different”. So, how about this, Terry Gross, and all the other offenders? “My guest tonight is Toni Morrison.” No need for extra words, conclusions, conditions. Just tell us what you want to tell us. Don’t try to get all fancy. I am in the conference room. If anyone asks, please tell them where I am. If they don’t, then do what you want about it. Yes, I know Sunday has come and gone. I intended to write Sunday, but the thought of powering up the computer was just too much. Then I got busy last night. and from then on, I was happy. 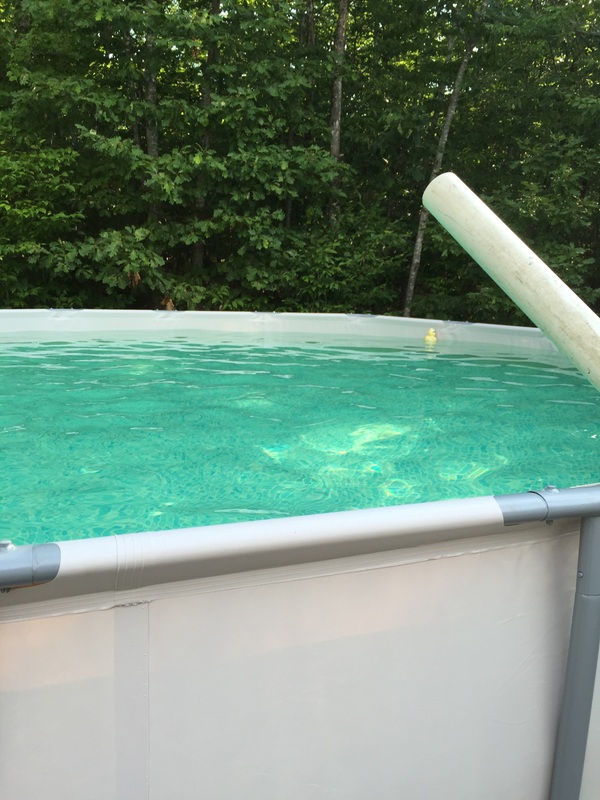 I didn’t get all the chemicals sorted out and in until last night, but I swam in it anyway. And was cool. In fact, I needed a blanket Saturday night. 🙂 A thinks I am nuts. I think she is nuts to not get into it. The seats, on the other hand, were NOT comfortable – folding chairs for three hours is tough. 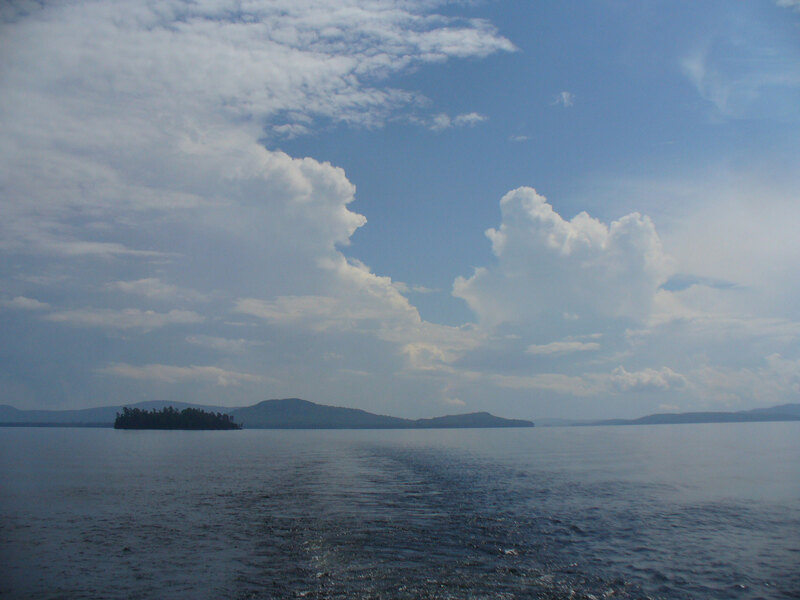 I can’t imagine how sore we would be if we took the 8 hour full lake cruise! The lunch was delicious – the galley is run by a woman who clearly loves to cook – she was telling me how she loves her job, they let her choose the menu and the specials, so she has fun with it. Her husband is the Captain, and he is retiring this year, but she decided she is just not ready yet. That is a sign of a good fit, employment-wise. Lucky woman! 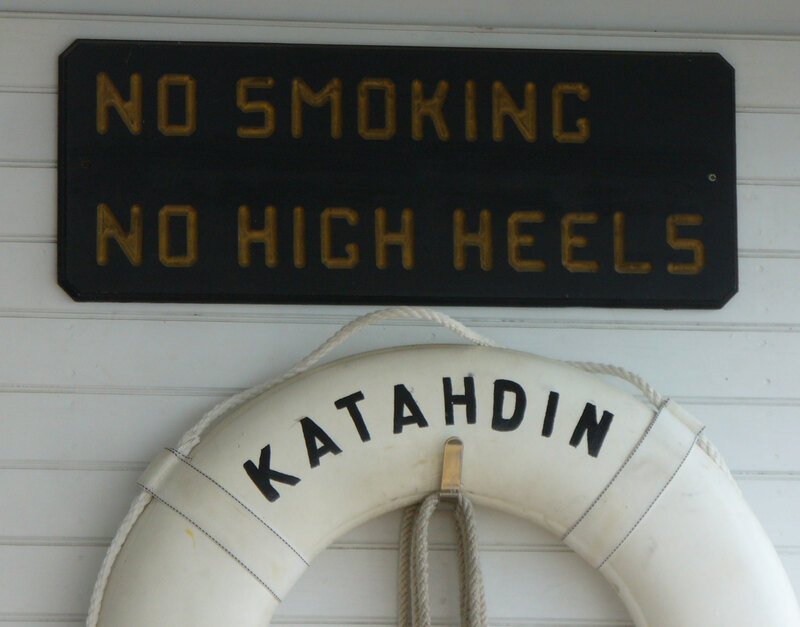 This sign made us laugh – would people really wear high heels on a boat? Sunday I did chores early – dump and grocery store, and then spent lots of time knitting in the house with all curtains drawn, or out in the pool. It was a day to not do much. A even cancelled her standing golf date with my step-dad. Of course, she watched the PGA championship on TV, so we still had our golf fix. I love my pool! I love my pool! I love my pool! It saved my sanity this weekend. It was too hot to think of a beach, or even our favorite lake. 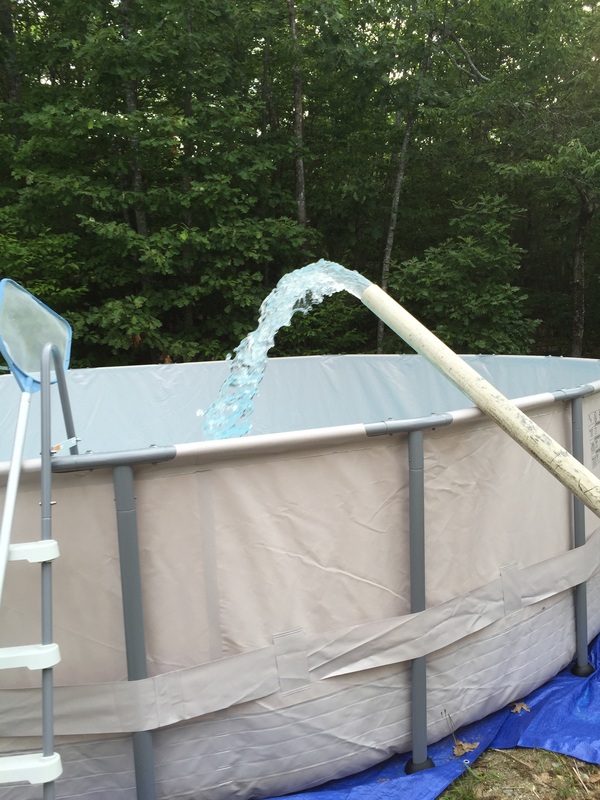 I set the pool up so it only gets sun in the middle of the day, morning and afternoon it has some shade, so I can use it a good part of the day without disobeying the doctor’s orders to avoid the sun. 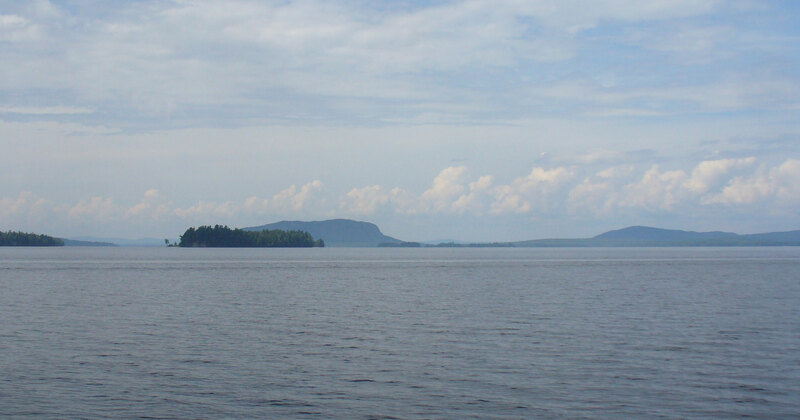 Here’s a photo of beautiful Mt Kineo in the haze to get you through the rest of the week. 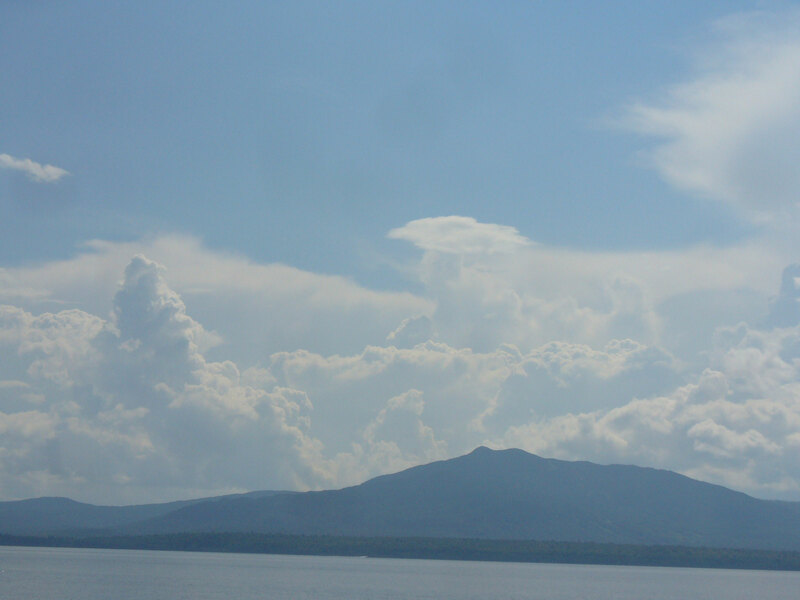 Author salpal1Posted on August 18, 2015 August 18, 2015 Categories how I spent my day, how it came outTags family, Katahdin, knit, Moosehead Lake, Mt Kineo, pool, Steamboat, summer day14 Comments on Sunday update very late! I got it all lined up. Called the local pool store, found out who to call for water. Called them Tuesday. Swallowed my shock at the price and said yes, send a truck, please. Made all the plans around a delivery at an unknown time. Got a call at 8:30 this morning. Excited! They were coming earlier than I could have hoped for! Only to have excitement quickly turn to dismay as she said “We can’t deliver your water.” Not “we can’t deliver you water this morning” or “Today” but we can’t deliver your water. Period. 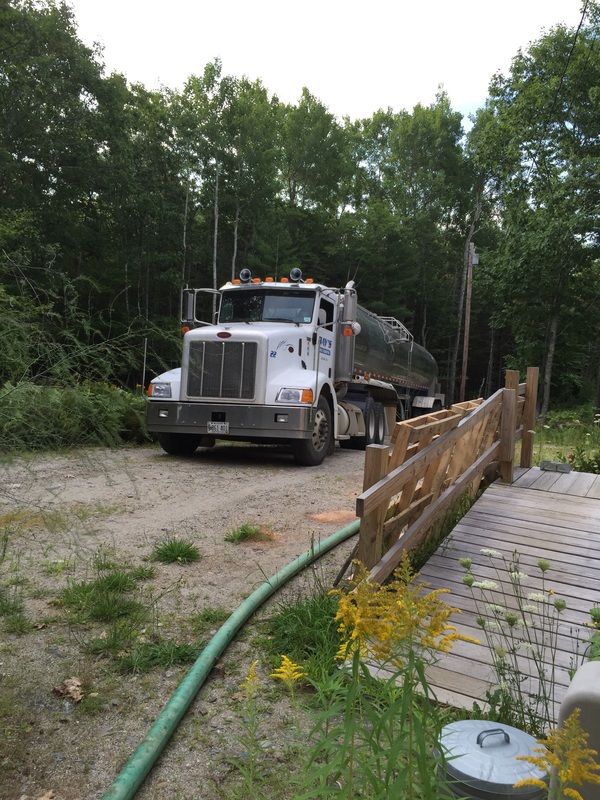 It seems when they got the tanker truck out to fill it, they found it was dead and would have to be hauled to the garage, and they had no idea when it would get there or what would be wrong or when it would be fixed. They had no other ideas of what I could do. The fire department doesn’t deliver water. So, I thanked her nicely and hung up. After a few moments of swearing and crying thinking, I called the pool place back. they gave me the name of a company they use – a bit farther away. I called the number and did as instructed in the message. left my name, my number, the size of the pool and where I live. But was disheartened to hear “I’ll get back to you when I get in tonight” which leads me to believe no water this weekend. I could be wrong, he could deliver on Saturday. Of course, we will be gone all day. How can it work? Will he accept that I will leave him a check in the door? What if he can’t find the place? It isn’t really on GPS. There is another pool store that I will continue to try to reach (busy busy busy) but I would be surprised if they know of a place that my first one didn’t. The hose is on. Half an hour at a time. It’s up over my ankles now. The weather report says high 80’s all weekend, going even higher into next week. Perfect pool weather. I’ll show them. 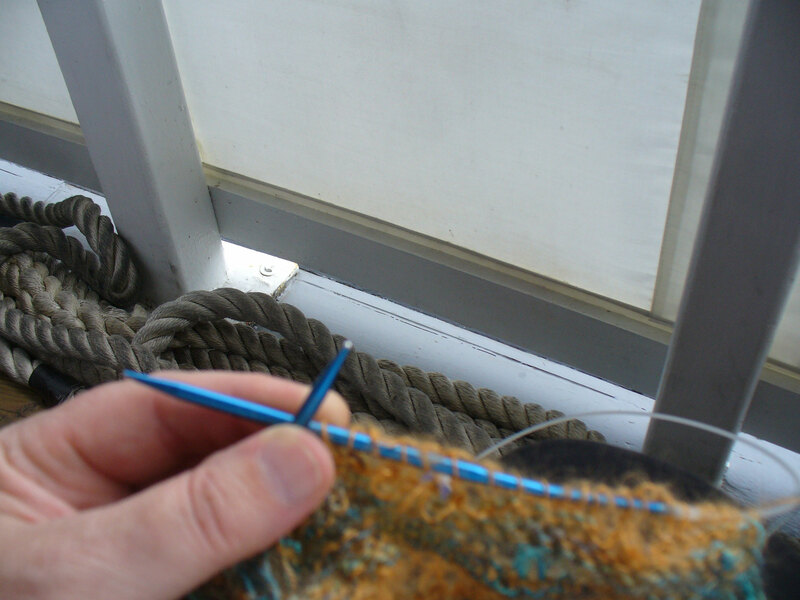 I’ll go knit. Author salpal1Posted on August 14, 2015 August 14, 2015 Categories how it came outTags pool, summer day5 Comments on WAAAAAAHHHHHHH! The PO is on it – one of us will have to go as it has been a week. Go to Deer Isle to drive the cart (and knit) while A plays golf, and go to my dear old Stonington Farmers’ Market. If we don’t do it this week, we will do it when we are on vacation next month. There will be other things happening, you can be sure, but I am so excited that swimming is likely a part of the plan. The rest of the weekend? 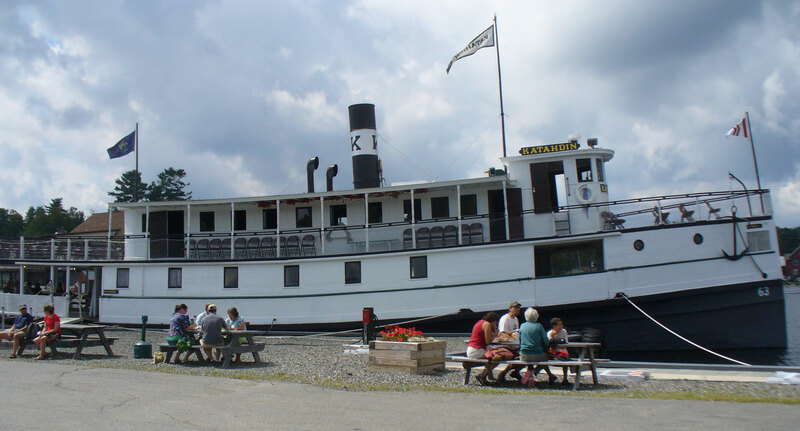 We plan to go up to take a ride on the Katahdin steamship in Moosehead Lake for L’s birthday celebration – feeling better about it knowing that our murderer-at-large for the last several weeks (9!) turned himself in last night. Not that he would have come after us, but it just was an edgy feeling. 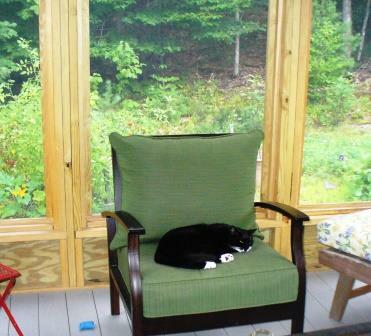 Author salpal1Posted on August 14, 2015 August 12, 2015 Categories how I plan to spend my day, what I am thinking about making, What I loveTags Friday, Katahdin, Kate, knit, pool, swim, to-do list, Weekend plans6 Comments on Drum roll, please!